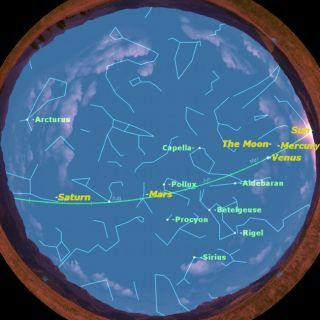 On Thursday April 15, 2010, the evening starts with a triple conjunction of the moon, Mercury, and Venus, then continues with Mars visiting the Beehive. Full Story. On Thursday night, April 15, you will have a wonderfulopportunity to view all the naked eye planets in one night. Just after sunset, lookfor Venus shining brightly just above the sun. It will be the brightestthing in the sky other than the slender crescent moon, just below and to theright of it. The moon is just a day and a half past new moon. Just below and tothe left of the Moon, look for a tiny speck of light: the planet Mercury. Notice as the stars begin to come out that the brighteststars are almost all in the western half of the sky. This is because the winterMilky Way is setting in the western sky at this time and, when we lookeastward, we are looking perpendicular to the disk of the Milky Way towardsintergalactic space. There are few bright stars in this direction, the mostobvious being Arcturus, Regulus, and Spica. Look also for Saturn in this direction, slightly south ofeast, halfway between Regulus and Spica. Saturn?srings are still almost edge on to us, so that the planet is less bright tothe naked eye than usual, and less beautiful in a telescope because its ringsare almost invisible. About an hour after sunset, we can see four of the fivenaked eye planets plus the moon, arrayed in a giant arc across the sky, theecliptic. Where is the fifth planet? Jupiter is still hiding shyly behind thesun. Some time this month, if you look carefully just before sunrise,you should be able to spot Jupiter as it emerges from morning twilight andbegins to dominate the early morning sky. It will be low on the horizon, wellto the south of the rising sun. All of the above is described for observers in the northernhemisphere. If you live south of the equator, you will see a somewhat differentset of events. The triple conjunction of the moon, Mercuryand Venus will be harder to see. On the other hand, Jupiter will be muchmore easily visible in the morning sky. Fortunately, Mars and Saturn areequally visible no matter where on Earth you live.